Morihei Ueshiba O-Sensei (“venerable teacher”), the Aikido Kaiso (founder), was born in 1883 in Tanabe, a coastal town in southern Japan. From the time of his youth, he studied various martial arts, including sumo, swordsmanship, spear technique, staff technique, and various styles of jiujutsu — particularly the Yagyu and Daito styles. From youth, Ueshiba appears to have been a deeply sensitive and spiritual person. Eventually influenced by the charismatic spiritual leader and artist Onisaburo Deguchi, he came to view his martial training as a means of personal purification and spiritual training. Over his lifetime, O-Sensei saw Japan involved in some of the most violent conflicts of the 20th century, culminating in the Pacific War. It was during this time that he founded Aikido, declaring it a way of joining the peoples of the world together in peace. The Kaiso’s incredible technical expertise and charisma brought him tremendous support from high-ranking military officers, government personnel, and the Imperial family during his life. Following his death in 1969, he was posthumously awarded an Imperial medal for his unique contributions. Recognitions and honors aside, it was the universality of his insights and his vision of the martial Way as open to all sincere students that led to the phenomenal growth of Aikido around the world. The noblest philosophies and intentions of the samurai have become a part of global culture, and give spiritual sustenance to millions of persons of all cultures; this is largely due to the groundbreaking influence of Morihei Ueshiba O-Sensei. Kisshomaru Ueshiba, Nidai Doshu (the second “master of the Way” of Aikido), son of Morihei Ueshiba, was born in 1922. From early youth, he trained under the guidance of his father. During the confusion of the wartime period, when Allied fire-bombings reduced much of Tokyo to ruins, he remained in the city and preserved the original dojo building. Following the war, as Aikido entered its golden age and began to attract public attention, he was instrumental in leading and organizing what would become the Zaidan Hojin Aikikai — the government-recognized, not-for-profit organization which exists today as the center of world Aikido. 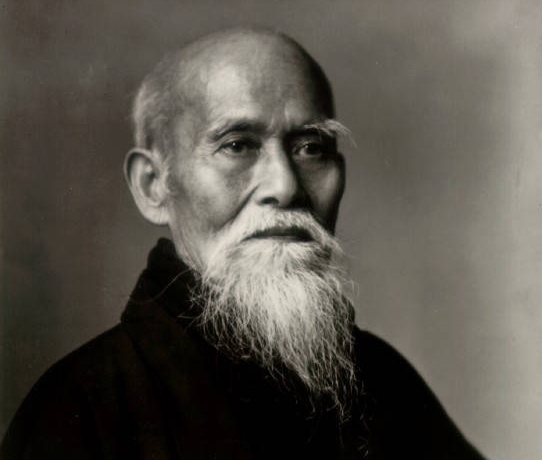 Upon the death of O-Sensei in 1969, Kisshomaru Ueshiba was named the second Doshu of Aikido. From that time on, Doshu quietly went about the business of spreading Aikido internationally. The tremendous expansion of the art, and the now millions of practitioners, can largely be credited to his efforts. It was he who coordinated the sending of Japanese Shihan overseas, thereby founding and developing the seeds of large organizations in other nations. He also maintained the strong support of government officials and businessmen in Japan, and built new support of this kind internationally. His many publications on Aikido technique and philosophy have further spread Aikido’s influence. The high educational and professional standards of Aikido, and the respect it has gained, are a result of these efforts. In 1999 Kisshomaru Ueshiba died in Tokyo, having successfully transformed the vision of his father into an international movement. Moriteru Ueshiba Moriteru Ueshiba, son of Kisshomaru Ueshiba, was named the Sandai (“third”) Doshu shortly after his father’s death. Before that time, he had served as the Aikikai Hombu Dojo-cho (“headquarters dojo director”). The Doshu has carried on in his father’s tradition of Aikido at the highest level, with clean and powerful technique. Now taking over the leadership of the Aikikai organization, Doshu brings to his position an already full life of training and instruction. The Aikido world has high expectations that, under his leadership, Aikido will continue to grow and expand in fulfillment of O-Sensei’s dream.